This apartment is 1/2 of a shotgun double. It has just been completely renovated with all new appliances in the kitchen and newly refinished hardwood floors. It has a nice front porch and is within walking distance Oak street which features numerous restaurants (including the famous Jacques-IMO's), bars (the Maple Leaf), vintage shopping and coffee shops. Tulane University is about a 20 minute walk and the nearest streetcar stop is 5 blocks away, which will easily transport you to the French Quarter. We are also located within walking distance to Maple Street, which is another dining/shopping destination. 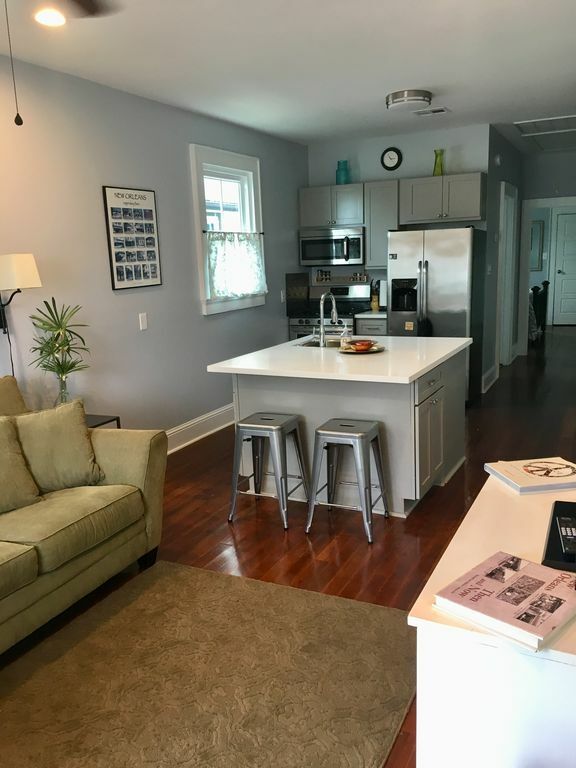 The apartment has an open kitchen/living area with a sleeper sofa, 1 bedroom with a king size bed, 1 bathroom, a very large closet and a laundry room. It is best for just 2 people, but can accommodate 4 people as long as privacy is not an issue. Pets are considered on a case to case basis, with a pet fee. We request that our guests be considerate of the neighbors and the long term tenants next door, and at least 25 years of age. Non smokers only please. Thanks for considering our property and our beatiful city! My husband and I moved to New Orleans 20 years ago from San Francisco. We love our beautiful city and are enjoying raising our 2 daughters here. When I am not managing our properties, I am a night shift RN. This property is new for us but we have managed other short term rentals for years, all with excellent reviews. My priority is to make sure my guests are happy and get the most out of their visit to New Orleans. Staying here will provide you with a more neighborhood feel of uptown New Orleans. You will be out of the hustle and bustle of the French Quarter, but it is still easily assessable. The property has a lockbox to assure easy entry at any hour. Before even arriving in NOLA Jenny's communication was great. Jenny left us great tips on what to see and how to get around. Loved the place. Clean and comfortable. Perfect for a couple like us. Would definitely stay there again. When we arrived we were surprised that the owner had bought us a bottle of wine, fruit and snacks. It’s very cute and the bed was very comfortable. Would definitely stay again. The house is adorable! Perfect amount of space for my husband and I, we will definitely be staying there again! The quaint attractive property was everything. This was my first experience but it won't be my last. Jenny was so helpful and calmed me several times during the process before my stay. I was able to find more quaint places to eat, other than my normal New Orleans spots. This trip was much needed and the property made it so much better. We love Jenny's house. It's very comfortable and cute. We hope to return next time we're in New Orleans.